SILVER SPRING – A solid cadre of WDC members began filling the intimate corner room this evening, trickling in to the sight of well-known friends and familiar faces to those on the political circuit in Montgomery County. Lucy Freeman’s famous chocolate chip oatmeal cookies fed small conversation among members of the community and representatives of the Montgomery County Police Department (MCPD) who had arrived for an event born of recent national tragedies. The evening was pulled together by the Education Committee to shed light on how MCPD conducts its business, how it stacks up to its peers around the nation, whether the incidents that spurred the #BlackLivesMatters movement could happen closer to home in Montgomery County, and a slew of other issues that has been in the public dialogue from firearm regulation to the war on drugs. The audience’s personal familiarity with the police officers combined with its initial applause in recognition of National Law Enforcement Week and in appreciation for all that the police force does in Montgomery County indicated that Chief J. Thomas Manger would be well received by this audience of Democratic activists and elected officials. Chief Manger took the podium to begin his presentation with a basic overview of crime statistics in Montgomery County but only after he acknowledged the importance of meetings such as this to the very foundation of the legitimacy of any police force, which he said is established by the trust and confidence of the community it serves. Montgomery County is divided into six district stations, the busiest of which is the third district, containing Silver Spring. Homicides, though still low for a population of 1 million people, have slightly increased in the past year because of gang related activity. Manger explained that there is a higher incidence of violent crime in areas of higher population density and poverty, while crime is inversely correlated with high school graduation rates and rates of MCPS students on Free And Reduced Meals (FARM). Reflecting the audience’s apparent warmth towards the police force, Manger mentioned that the public generally has a high level of trust and confidence in Montgomery County’s police force. Continuing on with the argument that his is an accountable police force, Manger directed the audience to an annual use of force report published on the MCPD website that documents the amount of times force was used and how many people were injured the use of that force in the previous year. He acknowledged that of the 40 officer-involved shootings in the past 12 years, 13 of those incidents were fatal to the targets. Manger was quick to point out that all individuals who were shot by MCPD officers were armed, mostly with guns but occasionally with knives, and that after each incident independent legal reviews of the cases were conducted. Manger presented a compassionate and professional police department that uses force only sparingly and when warranted, more frequently de-escalating conflicts than precipitating confrontations. He showed a video of a police officer risking his life to save an unconscious citizen from a burning car and stressed his creed of service, which he presented as a form of the Hippocratic Oath to do no harm, by even providing justification for the militarization of police, which he explained allowed his officers to retrieve an injured, trampled man in the Baltimore City riots of 2015 who would not have been reached by EMS crews were it not for the armored vehicle that was at his disposal last year. 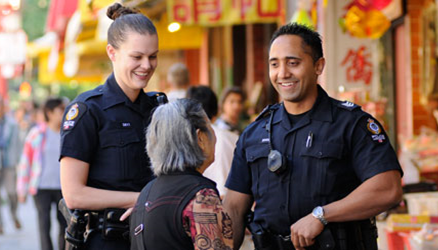 The common theme of the importance of having the police force reflect and respect the community, and vice versa, thread itself throughout the conversation. Manger spoke to his efforts to increase the demographic diversity of his police force, having tripled the number of Latino officers in the past decade, stating that the “goal of every police department should be to reflect the diversity of its community.” He said that the department has lately been focusing its efforts on connecting with youth in the community. He wryly observed that the “average age of this crowd is a little bit above 18,” eliciting a few chuckles from the audience. Captain Plazinski, Director of the MCPD Training Academy, then spoke about the rigorous and continuous training that officers undergo that prepare officers to interact with the community, to deal with drug overdoses (heroin and heroin look-alike drug overdoses in particular have been rapidly increasing throughout Maryland lately), to avoid situations where deadly force might become necessary, and to interact with those who have mental illnesses. The relationship between the community and the police force is valued at such a premium that for those who would like to learn more about what the MCPD encounters on a daily basis the force offers hands on policing experience with both a Citizens Police Academy and a Citizen Ride-Along in a patrol car with a police officer. The MCPD clearly has its hands outstretched to the Montgomery County community it serves, and in a room full of Democratic activists committed to public service those hands seem to be warmly received.